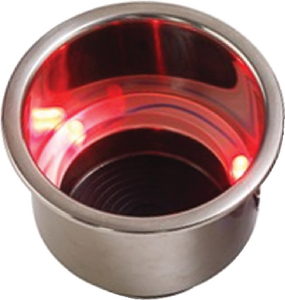 LED Drink Holder has three LED's. Dual purpose design allows the use of beverage cans with or without insulated can wraps, as well as most sizes of bottles. The bottom is padded with a rubber insert to prevent rattling, and the drain fitting allows water to be drained into the bilge - use 1/4" tubing secured with a tie-wrap. 12 volt DC. Stamped 304 stainless.